Holds the record for the longest continuous period of production for any design. In 1782, the bald eagle was chosen as the national symbol of the United States, so when the country’s coinage system was defined in 1792 it seemed natural to call the highest denomination, the gold $10, an eagle. The smaller gold denominations were then designated as fractions of the eagle and the smallest was the quarter eagle ($2.5) first issued in 1802. After going through several design changes, in 1840 the coin settled on a design that would last for the next sixty-seven years – Christian Gobrecht’s ‘coronet head’ Liberty. Gobrecht modelled his portrait on a figure of Venus from the painting Omnia Vincit Amor by American artist Benjamin West. It showed Liberty facing left, hair tied in a bun secured by a string of beads and wearing a coronet inscribed LIBERTY. It remained on the quarter eagle without any major changes until 1907 and the coin holds the record for the longest continuous period of production of any design. During the second half of the nineteenth century, huge amounts of gold were discovered throughout the world. In fact, around ten times as much gold was produced in the second half of the nineteenth century as in the first. Even more remarkably, in the 25 years between 1850 and 1875 more gold was discovered than in the previous three and a half centuries. The discovery of gold sparked several gold rushes as thousands of fortune seekers set out in the hope of striking rich. One of the most famous of these gold rushes followed the discovery of gold in California in 1848. On 24 January 1848, James W. Marshall found gold on land in California that belonged to a Swiss man named John A. Sutter. The two men agreed to become partners, but despite their best efforts to keep it secret, news of the find soon leaked out and in 1849 the region was besieged by would be millionaires. By the following year about 80,000 of these ‘forty-niners’ had made the journey to California, some of them from as far away as Europe, China, and Australia. In fact, by 1852 the population of California had swelled to around 269,000 and by 1856 it had topped half a million–the result of one of the largest human migrations in history. Although only a small percentage of these immigrants actually became rich, their presence was an important stimulus to economic growth. Agriculture, commerce, transportation, and industry grew rapidly to meet the needs of the settlers. Cities were founded where wilderness would otherwise have prevailed for many decades. When Congress outlined the United States’ first regular coinage in 1792, it included gold $10, $5 and $2.5. 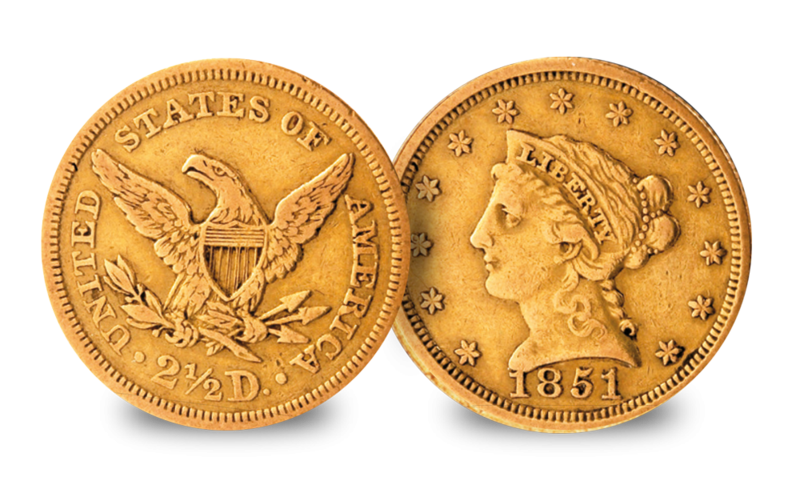 However, the first gold coin did not arrive until 1795 with the introduction of the $10 (eagle) and $5 (half eagle) gold pieces and it would be many years before the coinage expanded to include a one dollar gold coin. When one finally came, in 1849, it was as a direct result of the Californian gold rush. Faced with the necessity of converting vast amounts of gold bullion into coins, the US Treasury Department introduced both the USA’s smallest (the $1 at 13mm) and largest (the $20 at 34mm) regular-issue gold coins.